HasbroToyShop.com is seeking your holiday dollars and they’ve got a new product and an offer to tempt many a Joe fan! 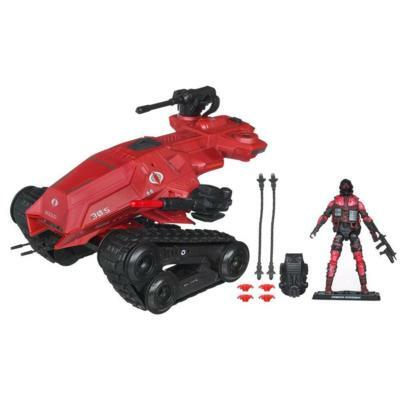 Just added to their “New To HasbroToyShop” section is the Crimson HISS w/Crimson Horsemen. Retailing at $19.99 it’s a slick new update on the Pursuit of Cobra HISS from last year. Plus, it’s piloted by the first-ever Crimson Guard pilot specialist! However, use the discount code “FNF20FS” and receive 20% off your order with FREE shipping! Even better– there’s no minimum order so army builders can purchase tanks like the plastic candy they are! There’s still time to finish your holiday shopping! Shop now and save 20% OFF plus FREE SHIPPING on your next purchase at HasbroToyShop.com. Simply enter promo code FNF20FS during checkout to enjoy the savings. You’ll find the season’s hottest brands like, NERF, PLAYSKOOL, MONOPOLY, LITTLEST PET SHOP, TRANSFORMERS, SESAME STREET, BEYBLADE and more! Feel free to share this special event with friends and family! Offer ends December 18, 2011. 20 % off and FREE STANDARD SHIPPING on most orders at HasbroToyShop.com. Not valid on previous orders. Offer excludes purchases of HasbroToyShop.com exclusives, Hasbro’s Ultimate Gifts category, and PLAYATHON Fundraising Kits. This offer cannot be combined with any other coupon or offer. Subject to terms and conditions of use and HasbroToyShop.com policies. Void where prohibited. Offer expires December 18, 2011 11:59 pm (ET). So, go get ’em gang!